Seven college students are traveling to Guatemala May 20-26, to assist the children and families of Escuela Integrada. St. John’s college students include Carter Woolly, Caroline Plyler, Juliana Anderson, and Katheryn Rusher, who will be joined by college students from Bethel Lutheran Church in Virginia. 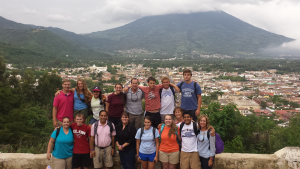 This mission trip was designed and requested by the college students from St John’s who have previously been to Guatemala. Julianna Anderson, who has chosen to spend her summer break as an intern at the school, will co-lead the team with Paula Bohland. During the trip the students will make home visits to children sponsored by St John’s, bring food to families in need, install life saving stoves into the homes of 10 families, participate as English language tutors, assist with the Girl’s Empowerment program, play soccer with the kids, and engage in local cultural activities. Please offer prayers for this group as they journey to Guatemala on this special mission trip. If you are interested in participating in an Adult mission trip, St John’s is hosting another opportunity this summer, July 7-14. Contact Paula Bohland at Paula@wearegraces.org for more information or to support these trips financially.